The UK National Panorama Steelband Competition takes place on the Saturday evening before Carnival, with six of the country’s top steelbands each playing a 10-minute piece from memory in the hope of being crowned the 2018 Panorama champions. The competition is now in its 40th year, but this year, for the first time, it will be a ticketed event with all money raised split among the musicians equally. 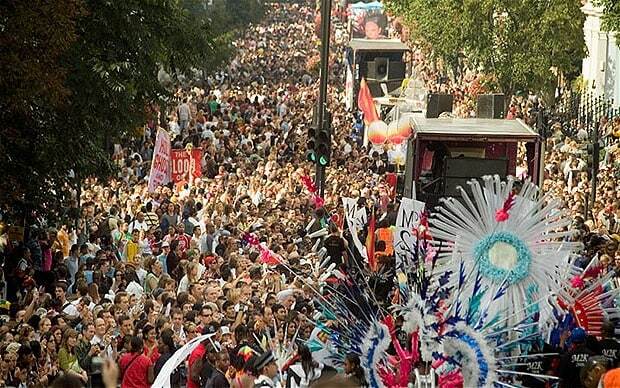 Plus there’ll be food, dancing and the chance to vote for your personal favourite on the Notting Hill Carnival App. 6-11pm. Tickets from £5. You can do Carnival without the crushing crowds and tube station bottlenecks, so long as you’re willing to get up early… Drawn from ancestral Caribbean tradition, the J’Ouvert celebration, known as the ‘opening of the day’ is a time when the early risers cover their bodies in mud, powder and chocolate to celebrate the start of Carnival. When the sun is up, the masquerade begins. If you manage the early alarm call, don some clothes you’re willing to get dirty and get involved in the messiness (there will be talcum powder and paint cascading through the air!). J’Ouvert morning is one of Notting Hill Carnival’s best kept secrets, starting at 6am and lasting till around 9am outside Sainsbury’s on Ladbroke Grove. Kick off your Carnival weekend early with a specially themed Vegan Vibes street food festival at Greenwich Market, organised in partnership with vegan-themed event company Plant Bass LDN. A celebration of the capital’s best vegan street food, Carnival Vegan Vibes will showcase the tastiest vegan street food from Eat Vital, Patty by Nature, Irie Kitchen, Red Tent Ethiopia, Little Leaf Pizza, Veganuti, Vegan Garden and En Root, alongside vegan beers, cocktails and wines. You can also chill out in the Love Shack to tunes from Ragu Zulu Rebel with a live band and DJs Jey Flash and DJ Deccy. 6pm-10pm. Pop Brixton is getting in the carnival spirit this Bank Holiday weekend with a series of late-night parties. Running all weekend and set to the tune of the finest dancehall, ska and reggae sounds, Pop’s parties are the next best thing to being at Carnival. Live sets from the likes of the Just Vibez crew and Manu & Ando will set the carnival vibe on Friday and Saturday, with the celebratory atmosphere continuing with a hip-winding after-party with KD Soundsystem on Sunday 26 August. Across the weekend guests can fuel up at one of Pop’s many resident street food traders, with Mama’s Jerk bringing the heat of the Caribbean to Brixton with their homemade Jamaican fare, whilst Pop’s resident bars will be serving up drinks to keep the party going. 7pm-12am each night, free entry. Mayfair favourite Novikov Restaurant & Bar is hosting a huge Notting Hill Carnival after party on Sunday 26 August. Novikov’s Lounge Bar will recreate the dazzling colours and hypnotic beats with an unmissable event sponsored by Grey Goose vodka and Bacardi. There will be a live band playing samba sounds, as well as DJs Eren and Femi Fem spinning West Indian beats. What’s more, special Caribbean-styled cocktails, including Wild Orchid (Grey Goose vodka with peach bitters, Peychaud’s Bitters, St-Germain and lemon) and Inner Circle (Bacardi Superior with St-Germain, Angostura bitters, galangal, fresh lime and ginger beer). Free entry. For the second year in a row, The Sun Tavern has come to the rescue of those who want to ‘do Carnival’ without schlepping from east to west London. Instead, The Sun Tavern will be bringing its own Carnival vibes to Bethnal Green, jith free jerk chicken wings from Hackney’s own Caribbean Kitchen, The Sun’s resident Jazz band playing ska and reggae, along with their usual crowd favourites, plus The Sun’s Umbrella Brewing alcoholic Ginger Beer for only £2. In classic carnival fashion, the party will continue until late with The Sun’s favourite DJ, Paul Day, on the decks until 2am with a Reggae ’n’ Roll twist set. 5pm-2am. The London Cabaret Club will be hosting a Summer Bank Holiday Carnival Special with a striking new production at The Bloomsbury Ballroom. The show will take guests on a tropical tour of immersive cabaret, featuring an evening of vibrant live performances, colourful carnival dancers, rum-based cocktails and a Caribbean menu. Enjoy extravagant live performances from Brazilian Carnival dancers, as well as Patrick Alan’s Latin All Stars, plus the greatest salsa vibes mixed with funk, soul and today’s greatest pop hits featuring world class trumpeter Yelfreys Valdes. Tickets from £25 for a Show Ticket or £75 for the show and dinner (VIP tickets available). Carnival and jerk chicken are inextricably linked, but if you don’t want to wrestle the crowds at Carnival, head for the third annual Caribbean Food Week Festival at the Bernie Spain Gardens on the South Bank instead. Hosted by Encona and Grace Foods, the event will bring Caribbean culture to life through live cookery demonstrations, authentic street food, market stalls and live music to complete the vibe. 11am-7pm. Free entry. Tuckshop is taking over three rooms at Queen of Hoxton with carnival dancers and hefty line up of forward-thinking DJs playing disco, Afrobeat, house, garage, hip hop, dancehall and more. DJs include Ahadadream – a Boiler Room team member and celebrated producer with airplay on Radio 1xtra, Kiss, Rinse, Radar and Reprezent – and Miguel E in the Global Carnival Rhythms Room; Marcel Vogel and David Conde in the Tropical Disco Room, and Tuckshop Music Residents and Manu & Ando in The Melting Pot bar. 8pm-3am. Tickets £5. This year, Stevie Wonderland takes over the Bussey Building for their annual Notting Hill Carnival Sunday after party. One of their biggest, it’ll take over the four floors of Peckham’s Bussey Building for a journey through the global sounds of disco, afro, house, dub, jazz, soul and beyond. In Room 1, hosted by Stevie Wonderland, you’ll find Romare, Auntie Flo and Mr Mendel; in Room 2, hosted by So Flute, it’s Alexander Nut, Donna Leake and Danuka; in The Theatre, hosted by Banana Hill, it’s DJ Okapi and Banana Hill DJs. You can also enjoy the Soul Jazz Records Sound System all night long. 10pm-5am. Tickets from £15.